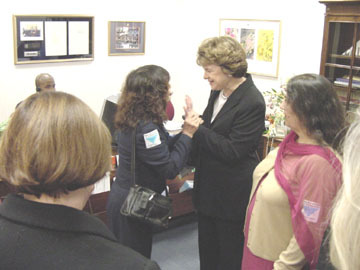 The Blue Triangle Network makes their debut on Capitol Hill lobbying Senators Diane Feinstein and Russ Feingold in October 2003. The Islamo facist BTN is virulently anti American and anti semitic American Muslim Voice and American Muslim Perspective are both aligned with the American Muslim Council. .
Nearly identical in format, the AMV and the AMP websites represent the new "Americanized" version of Jihad which makes use of patriotic symbolism, and the mantra of civil rights as a front for their militant Islamist agendas. The red white and blue all American website format shows how the Islamists are establishing themselves and the 'Kaliphate' i.e., trying to replace the Constitution with the Koran to reach their goal of establishing a " United States of Allah". In order to push their militant Islamist agendas from within Muslim groups are joining forces with the left . The Blue Triangle Network -AMV-and AMP alliance is representative of how the new ideological and strategic alliance between the radical left and militant Islamists operates. The AMP and AMV directors Samina Faheem Sundas and Abdus Sattar Ghazaqli are linked to the Blue Triangle Network. The Blue Triangle network has begun reinventing themselves from a leftist fringe group to a national organisation due to their collaboration with CAIR and other major American Islamist groups. The Council on American Islamic Relations, a Saudi funded front group for Hamas participated in the 2003 retreat organised by the BTN. "Politically speaking, I think the Muslim community is establishing a high profile in society," said Nihad Awad, CAIR's executive director. "It's very obvious that politicians are paying attention to Muslim voters." ..." that further development of CAIR's activities will be needed, specifically increasing its legislative influence and gaining the ability to sue in discrimination cases. "They are still the best Muslim player in the game, but they do not fully understand the game" if CAIR remains outside the legislative arena, said Khan. But, calling CAIR "the most successful Muslim organization in North America," Khan said that the group "has filled the gap and has captured the imagination of the American Muslim community." "Why would any emigrants -free anytime to leave the United States - wish to stay in a land so repressive ?" Information about the 2003 BTN retreat with a list of affiliates including the ADC, MAS, the AAI. The inclusion of these groups indicates Saudi funding behind the BTN. About 60 committed activists of all ages and nationalities came from or officially represented local and national organizations, including ACCESS, American Arab Anti-Discrimination Committee (ADC), Arab American Institute (AAI), American Civil Liberties Union (ACLU), National Lawyers Guild (NLG), Triangle Foundation, South Asians Against Police Brutality and Racism, Solidarity USA, Refuse & Resist! and its youth network, La Resistencia, Committee Against the U.S. Empire (CAU$E), supporters of the Revolutionary Communist Party, Libros Revolución in L.A., Revolution Books Outlet in Detroit, the Revolutionary Communist Youth Brigade (RCYB), La Resistencia Student and Youth Network, American Muslim Council, Muslim-American Society--Political Action Committee, and anti-war coalitions from Houston, Chicago, and northern California. "...Insisting that national security is at risk, the government has launched wide-scale assault on constitutional rights and civil liberties. In order to defend these violated human and constitutional rights, this network dedicates itself to mobilizing the broadest number of people to challenge and oppose this repression. We do not accept the racial profiling, erosion of civil liberties, roundups, indefinite detentions, secret charges, secret evidence, secret military tribunals and demonizing of Muslims, Arabs, South Asians and others based upon where they were born, the language that they speak, the color of their skin or the religion that they practice." The action plan included adopting the blue triangle as a symbol and the name Blue Triangle Network. In the Nazi death camps, members of various groups were forced to wear different symbols-- yellow Star of David for Jews, the pink triangle for gay men, the blue triangle for immigrants and stateless people. This hated symbol of oppression will now be transformed into a symbol of resistance. Randall Hamud, an Arab-American attorney from San Diego who on Sept. 12 was defending detainees, pointed out how citizenship does not protect people. He gave two examples of Arab-Americans in custody by the U.S. and by Israel. At the end of the summit, participants felt they had taken a big first step to stop the post 9-11 increasing repression of immigrants. They had a plan, a commitment to carry out the plan and a beginning organizational structure to carry out the plan. As one participant from a Houston anti-war coalition said, "We have to go home and build a movement." A delegation from California participated in the annual national conference of Grassroots America Defends the Bill of Rights from Oct 17 to 21st in Washington DC. The participants were: American Muslim Voice, Blue Triangle Network, South Alameda County Peace and Justice Committee, Silicon Valley for Civil Rights and Justice for New America. On the second day of the conference, members of the California delegation went to the Capitol Hill for lobbying and met Senators Diane Feinstein and Russ Feingold. 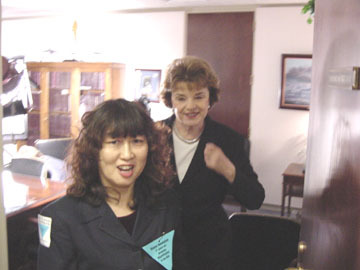 The delegation was stunned by Senator Feinstein's remarks that there is no evidence or testimony of abuse of the Patriot Act and that her office had received no calls complaining of abuse by the Patriot Act. She is a member of the Blue Triangle Network National Steering Committee and a founding member of Defense Committee of James Lee Muslim Chaplin. She is also the coordinator of the Muslim Nationwide Hotline, to help people regarding INS Special Registration and to protect civil liberties for all. She is the former National Coordinator of the American Muslim Alliance. In recent months, she has been speaking extensively on civil liberties issues, particularly the USA Patriot Act. 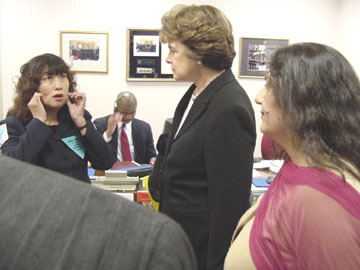 She was on the panel of Amnesty International USA National Hearings on Racial Profiling, held in Oakland on September 9. 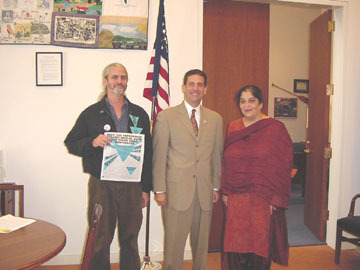 Ms. Samina Faheem Sundas has personally assisted two counties and eight cities of California in passing resolutions against the Patriot Act. American Muslim Voice's focus is to bridge the gap between Muslims and fellow Americans. This is one of the major goals of the AMV to fulfill an important need of linking all communities together. Since its inception few months back, the AMV is able to build bridges with many communities including: African Americans, Caucasian, Chinese, Latino, Japanese and Vietnamese communities. 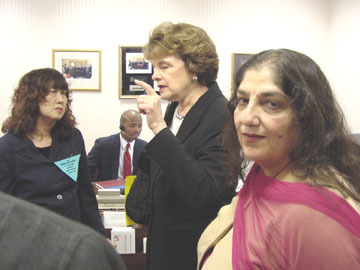 Case of the Ameen Brothers: The AMV, the PAA and the ACLU of N. California held a news conference in San Francisco in June 2003 with two young brothers who came forward to describe their experiences after voluntarily participating in the Immigration and Naturalization Service (INS)'s controversial Special Registration Program. The two brothers, one of whom is a 17-year-old teenager still in high school, were placed in deportation proceedings. The 17-year-old and his 19-year-old brother, who is attending college, have been in the U.S. with their mother for several years and do not have any immediate family in Pakistan. The AMV has launched a campaign to help Bahriyor Rakhmatov, a 20-year student from Uzbekistan, in Superior, Wisconsin. He was taken into custody on March 16, 2004 although his papers were under process with the Immigration Department. The AMV, has arranged an Attorney and appealed to help Bahriyor in raising bond money. Update: Bahriyor was freed on April 7, due to his brother's hard work. He was able to borrow money from people he knows. I can only imagine how hard he had worked to get his brother. We need to raise money for his attorney. Please help. The American Muslim Perspective and The American Muslim Voice appear to have the same webmaster and are virtually identical in format. As you can see from above the Executive Editor of the AMP Abdus Sattar Ghazali writes for the AMV. Both the AMV and AP are interconnected and work together the Blue Triangle Network which has grown from a small fringe group to an organisation which is affiliated with major militant Islamist groups like CAIR,ICNA, ISNA,MPAC,and the AMC. The Blue Triangle Network held its 2nd annual national retreat in Detroit, Michigan, in July. The retreat was attended by over 40 people from numerous organizations and individuals from BTN chapters around the country. The diverse group in attendance included members or supporters of La Resistencia, South Asians Against Police Brutality and Racism, Not in Our Name, Muslim Voices, Justice for New Americans, the Council on American Islamic Relations, the Lutheran Church, Japanese American Citizens League, Pax Christi, the Revolutionary Communist Party, and Refuse & Resist! The retreat focused on solidifying the structure of the Blue Triangle Network, formation of a National Office, national campaigns and major political questions we have faced in the past year of work. The necessity for a national office arose after a year of trying to centralize efforts of the Blue Triangle Network. Tasks like dissemination of fact sheets, blue triangles, responding to emails and other administrative task have to be done from a central location. The national office is required not only to centralize administrative work but also as a centrality for spreading the BTN's mission and orientation. It was agreed that a National Office is needed. We decided that the location for it be in Detroit as there is a huge community that has come under attack and also because in the past year Detroit has informally acted as a National Office. BTN has applied for a grant for $100,000 which would facilitate to set up the office, buy equipment and hire a staff person. The timeline to set-up an up and running NO was set for 3 months. By this time we will know if BTN has been approved for the grant. In the meantime however it was decided that chapters around the country do a membership drive to raise money for the National Office. Other ideas for fundraising included merchandising on the website, researching other grants and sending fundraising appeals to our email membership specifically for the National Office. Abdus Sattar Ghazali writes and is the editor of the American Muslim Perspective.Both the American Muslim Perspective and the American Muslim voice are connected to the AMC and groups such as MPAC .Below you will see there visit to Feinstein and Feingold in San Francisco together with members of the Blue Triangle and other radical groups. The AMV and AMP appeal for donations for the cynically named Liberty Fund on behalf of jailed terrorist leader Sami Al Arian. Appropriately a spokesman of the Liberty Fund and CAIR staffer , Ismail Royer, was convicted and jailed for plotting Jihad against the United States. As you can see in the article below,all the groups with which Royer is affiliated are active in the Blue Triangle Network . Ex Staffer for CAIR, other groups organised holy warriors against the U.S.
A former spokesman for several Muslim lobby groups in the U.S. pleaded guilty to serving as the leader of a Virginia-based terrorist network that conspired to train on American soil for "violent jihad." Randall Todd "Ismail" Royer – who most recently served as communications director for a fund-raising effort sponsored by the American Muslim Council – allegedly trained in Virginia for holy war against the United States and sent several members to Pakistan to join Lashkar-e-Taiba, a Kashmiri terrorist group with reported ties to al-Qaida. A federal judge sentenced him Friday to 20 years in prison. In a plea bargain, Royer claimed he never intended to hurt anyone but admitted he organized the holy warriors after the Sept. 11, 2001 attacks on the U.S., according to the Center for Security Policy in Washington, D.C. He was among nine men who either pleaded guilty or were convicted in connection to the charges. Two others were acquitted on all counts. Royer, 31, of Falls Church, Va., also was on the national staff of the Council on American-Islamic Relations, a group that considers itself a leading civil rights voice for American Muslims. Later, he was a spokesman for the National Liberty Fund, which is defending Sami al-Arian, the Florida professor in federal custody as an alleged leader of the Palestinian Islamic Jihad. The National Liberty Fund says it is combating the Justice Department's "opportunistic and politically motivated prosecutions." February 20th marks the first anniversary of Dr. Sami Al-Arian's detention on charges of financing the terrorist organizations overseas. Dr. Al-Arian, a prominent Muslim academician and civil rights activist since early 80s, is waiting for his trial that will not begin before January 2005. Dr. A-Arian helped establish several organizations including the largest grass root organization in the U.S., the Islamic Society of North America (ISNA) in 1981, the World and Islam Studies Enterprise (WISE) in 1990, and the National Coalition to Protect Political Freedom (NCPPF). While awaiting trial to begin in January 2005, Dr. Al-Arian is being held in a Special Housing Unit despite being a pre-trial detainee (presumably innocent) and faces abusive and inhumane treatment at the hands of the authorities. These circumstances have made it very difficult for Dr. Al-Arian's family to visit him. In order to see his lawyers, Dr. Al-Arian has to be handcuffed behind his back and bent over. The former University of South Florida engineering professor also has to write with pencils no longer than what golf players use to keep track of score. American Muslim Voice appeals to all Arabs, Muslims and fellow Americans to support Dr. Sami Al-Arian and his family in their plight. The AMV urges you to support Dr. Al-Arian in his ordeal by contributing to his Legal Defense Fund. You can write letters of support to him and can send books. You can send books directly to him from the publishers only. Since September 11, 2001, in the name of the war against terrorism, vicious attacks have been launched against the basic human rights of Muslims, Arabs, and South Asians in the United States from the highest levels of government. Insisting that national security is at risk, the government has launched a wide-scale assault on constitutional rights and civil liberties. In order to defend these violated human rights and constitutional rights, this network dedicates itself to mobilizing the broadest number of people to challenge and oppose this repression. We do not accept the racial profiling, erosion of civil liberties, roundups, indefinite detentions, secret charges, secret evidence, secret military tribunals and demonizing of Muslims, Arabs, and South Asians and others based upon where they were born, the language that they speak, the color of their skin or the religion that they practice. This network has been organized by a broad cross section of organizations, communities and individuals, both people who have stepped forward to stand with those targeted by this repression and people from the targeted communities themselves. We have a diversity of political perspectives, religious beliefs, and ethnic and racial backgrounds, but we are united in our determination. We are standing up and taking action. La Resistencia is a participating organization in the Blue Triangle Network! Below is one example of the deceit and disinformation being disseminated by Ghazali and Faheem and so called Muslim 'civil rights' groups like the AMA and PADF. This story of 'alien registration' focuses on the case of one Kamran Bokhari ,who is described as a"Pakistani graduate student at the LBJ school of MiddleEastern Studies in Austin" . Ghazali description of Bokhari's anxiety at the INS processing, quotes Bokhari stating that "your imagination runs wild". The trepidation on the part of Bokhari is contrived , since what the Muslim 'civil right' monitors 'forget' to mention is that Kamran Bokhari is none other then the spokesman for the Al Muhajrioun in North America, who was videotaped at an AM rally in front of the Israeli embassy in 2001 leading chants in support of Jihad and Bin Laden . In 2000 ,Bokhari brought over Anjem Choudary, the head of Al Muhajiroun from the UK, to speak at a symposium at Southwest Missouri State University where he was a student of political science. At the same time Bokhari he leading Al Muhajiroun, he was also the head of the Muslim Student Association, and founder of the Islamic Center of Springfield, which is currently under investigation by the Treasury Department in connection with Al Qaeda and ties to the Saudi terror funding network Al Haramain. At present Bokhari leads a 'double life' as the secretary and interim treasurer of the Islamist Association for Muslim Social Scientists and outrageously as geo political analyst for George Friedman's Strategic Forecasting Incorporated, a intelligence gathering and forecasting company regarded as a "quasi private CIA". The fact that Bokhari was processed by the INS without a hitch, and given an appointment to "come back within a year" begs the question as to why his past did not come under scrutiny. The fact that AMA and PADF , together with Ghazali and Faheem teamed up to highlight Bokhari's visit to the INS proves the militant Islamist intent of these groups being presented in the guise of safeguarding 'immigrant rights'. The American Muslim Alliance (AMA) and the Pakistan American Democratic Forum (PADF) are conducting a joint study on the psychological effects of the INS Registration program on non-immigrant Muslim students. Students from more than 20 Muslim countries are required to register with the INS; many of those who went for registration have been detained. The focal point of this study is to ascertain and evaluate the welfare and well being of the non-immigrant Muslim students in social, psychological, economic and legal terms. The INS Registration is a traumatic event for many non-immigrant Muslim students, that challenges their sense of safety and predictability and this may trigger strong physical and emotional reactions, says Ms. Samina Faheem, AMA National Coordinator. She referred to the case of Kamran Bokhari - a Pakistani graduate student in Middle Eastern studies at the LBJ School, Austin, Texas who describes his visit to the INS office San Antonio as tense. Bokhari said he was nervous because he didn't know exactly what the process would entail; he could only guess. "The rules of the game are not set. There was this anxiety about what's going to happen," he said. "Your imagination runs wild." After the interview, he was asked to smile for a digital camera and then had his fingerprints taken. Finally, the caseworker handed back Bokhari's documents and gave him a date for an appointment next year. The University of Texas had arranged for Bokhari and 12 other students, almost all Pakistanis, to take a shuttle bus to the INS office in San Antonio. "It's certainly not something that students are happy about," said Maka Hutson, immigration adviser for University of Texas' International Office. Ms Samina Faheem said that there are many cases like Bokhari which indicate fear and anxiety among the non-immigrant Muslim students about the INS process. She said that sending and receiving money is becoming difficult for the Muslim student while their ability to work legally on the campus is becoming impossible. A Pakistani student returning after vacation was detained at the Huston airport because he was carrying a paycheck stub for the work he did legally at the campus. The AMA/PADF groups have advised those needing help with the INS Registration to call the AMA/PADF Hotline to obtain free legal advice from AMA's advising attorneys. Ms. Samina Faheem said that this is a time of stress for the Muslim community and lots of rumors are going on. "We are helping the community by providing authentic and verified information, to people who are calling on our hotline, and sifting the wheat of fact from the chef of rumors and half truths." All the information will be handled in a strictly confidential manner. "This information will be used only in aggregate form without revealing the identity of any individual. 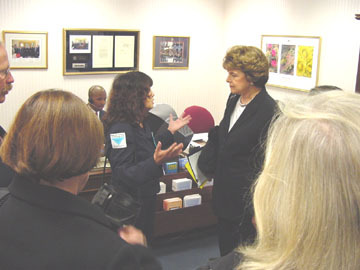 It will also be used to educate the media, the policymakers and the civil rights community," she said. Hotline toll free number is: 1-866-815-PADF (1-866-815-7233). San Francisco Protestors: U.S. Government = Nazi Regime. The San Francisco Chronicle reports today on a demonstration of about fifty "activists and civil rights advocates" outside a federal building in San Francisco to protest the National Security Entry-Exit Registration System (NSEERS) that requires immigrants from select countries to go through additional procedures. In the course of these steps, some of them have been detained and others deported. To be specific, as of Oct. 30, 2003, "83,519 men had voluntarily reported to immigration offices around the country to be fingerprinted and interviewed. Of those, 13,799 were put into deportation proceedings, 2,870 were detained, and 143 were arrested on criminal charges."